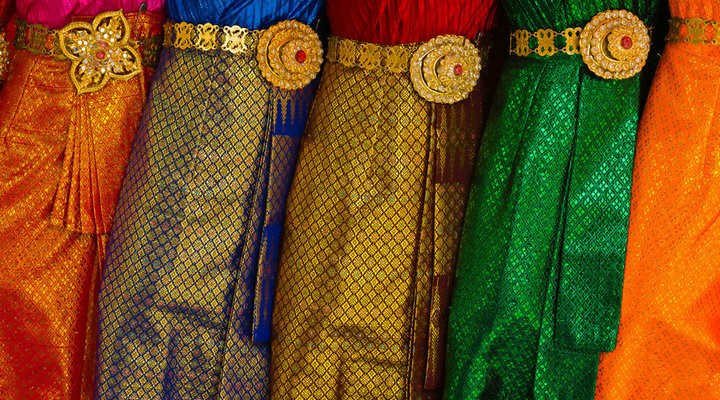 Thai women's clothing displayed outside an open air shop in Bangkok. "Walking down the street you'll find this if you're thinking graphically," Blaine says. "This was special—the range of colors and the way the material was hung. These types of images are great for establishing culturally where you are." A Buddhist nun, by window light, drinking tea, Drepung Monastery, Tibet. "She was perfectly illuminated, and in the cold morning the steam was rising off the cup. Before I could make the photo she stood up. I asked politely if she'd sit and drink again, and she kindly did." Thousands of prayer flags above the Yambulakhang Palace in Tibet. The five colors of the flags represent the five elements: blue for sky, white for wind, red for fire, green for water and yellow for earth. "With the 16mm fisheye I was able to almost fill the frame with the flags and still show the palace and landscape." A merchant selling flowers rows his boat on Dal Lake in Srinagar, Kashmir, India; late afternoon, with the 16mm fisheye. Everyday merchants row out to houseboats, selling everything from soft drinks and snacks to expensive jewelry and oriental rugs. Blaine used his SB-900 for a bit of fill flash. A canal scene in the water town of Zhouzhuang, China. "I’d spent several days in this town, which is known as the Venice of the East. I saw this scene the previous afternoon when it was busy with tourists. I went out early the next morning and got this tranquil view, with calm water and beautiful light." Buddha statue, Drepung Monastery, near Lhasa, TIbet. "In a dark temple I boosted the ISO to 3200 to make this, hand-held, at 1/250 second." Overview of Tokyo traffic from the Dentsu Building, Shiodome, Tokyo. "The ten-second exposure, on a tripod, blurred the moving traffic except for the cars stuck still. I'd gone to shoot the skyline from the skyscraper top, looked down and found this composition of converging roadways, multiple layers and brilliant color." "The more familiar a place is, the less interesting it is," Blaine Harrington told us not too long ago. An award-winning travel photographer, Blaine visits Asia frequently, and yet still finds it surprising, intriguing territory, and a source of near-endless picture possibilities. Travel in Asia is about discovery, as you see first-hand what you've only heard about or viewed on screens and in the photographs of others. In Asia you can explore a world that's very different from your own and bring back photographs that tell the story of what you've experienced. The key, Blaine says, is to think of yourself as a traveler rather than a tourist. "Bring along your curiosity, and strive to learn and discover as you take your pictures. Don't just document what you see. The more curious you are, the better your pictures and the stories they tell." Blaine maintains that travelers always want to know what's going on, want to communicate with people in the countries they visit, and to the extent possible given the relatively short time they'll be there, to understand the lives and the culture. "The more you can relate to people and situations, the more meaningful your images will be." He suggests doing some research before you go—"so you'll be able to make better decisions and ask better questions"—and to make up an itinerary of what you'd like to see, experience and photograph. "But keep it loose," he says, "so you'll have time to wander and follow up on the unexpected. And in Asia, there will always be the unexpected interest." Although he's been traveling and photographing for most of his life, he is still surprised, still discovering. "Nothing hinders my sense of wonder." Because of the remoteness of some places in Asia, you'll want to be as photographically prepared as possible. Blaine's always used Nikons, and his current go-to camera is the D810. He also carries a D700 as backup. He always takes along an SB-900 Speedlight, often two of them for easily set up, wireless on- and off-camera flash photos. He routinely packs four NIKKOR lenses: the AF-S NIKKOR 24-70mm f/2.8G ED, AF-S NIKKOR 70-200mm f/2.8G ED VR II, AF-S NIKKOR 14-24mm f/2.8G ED and AF Fisheye-NIKKOR 16mm f/2.8D. It's likely that's going to be more glass than you'll want to carry, so he suggests that the 24-70mm and 70-200mm telephotos will handle most situations. If you'd like to lighten the load further, consider a one-lens solution by pairing your Nikon DSLR with a wide-to-tele zoom like the AF-S NIKKOR 24-120mm f/4G ED VR or AF-S NIKKOR 28-300mm f/3.5-5.6G ED VR. Bring along your curiosity, and strive to learn and discover as you take your pictures. Don't just document what you see. The more curious you are, the better your pictures and the stories they tell. A maiko (apprentice geisha) at the Kitano-Tenmangu Shrine, Kyoto, Japan. "A geisha is perhaps one of the most recognizable, iconic images of Japan, and I was able to photograph this one in a tent near a festival as she was preparing for a performance. I couldn't ask her or any of the others to pose, but I stood at the back, quiet and unobtrusive, and took photos." She was sitting on the stairway in the Blue City, Jodhpur, Rajasthan, India, in the late afternoon as Blaine walked by. "I recognized a colorful image, revealing of culture and surroundings, and a perfectly natural pose." Early morning at the Floating Market, Damnoen Saduak (near Bangkok), Thailand. "The market opens around sunrise," Blaine says, "and the number of boats filled with tourists made getting a wide shot with only locals almost impossible. I focused on single boats, and got photos that read very quickly of the culture and the lives lived here. You don't need to show everything; one boat represents them all." The Great Wall of China, late afternoon. "I left Beijing in the dark and was at the Wall for sunrise. I spent 16 hours there. Going early means beating the thousands of tourists to the best places on the wall; they're having breakfast, I'm shooting pictures. Tours are okay, but the traveler goes on his own." Beijing East Road, Lhasa, Tibet. Around 7:30 p.m. the rain stopped and sunshine struck the street. Blaine saw it from his hotel room and went to the roof to make the photo. "When the bike rickshaw came into the scene and hit the bright spot in the road, I knew I had the shot. The rickshaw made the photo specific to an Asian location; otherwise it's any other city in the world." The remote nature of many Asian attractions doesn't prompt him to add more batteries and memory cards to his camera bag. "I take the same as I always carry—four 8-gigabyte CF cards, one 16-gig and four 32-gig SD cards, and three extra batteries for the D700 and one extra for the D810." But he does carry superglue, a Swiss Army knife and jeweler's screwdrivers, and has nothing bad to say about gaffer tape. He also brings along the pro shooter's friend: a sturdy tripod, but doesn't carry it to every location. Because rugged terrain and less than ideal weather are realities of travel photography in Asia, Blaine puts in a good word for drip-dry hiking clothes and REI Tech-Compatible lightweight liner gloves, a raincoat for himself and a rain cover for his cameras. "Traveling in Asia, especially in the Himalayas, means having at least a general idea of what the weather will be like. I always pay attention to and plan for the extremes so l know what clothing will be best. The key words are 'weather app' and 'layers.' "
Blaine makes his living from his images, so making sure they're safe and sound is vital, and he has an end-of-day routine that you probably won't want to emulate, but from which you might borrow some ideas. "I'll back up the images to two one-terabyte hard drives using my laptop to view and transfer them." He also has a standalone data storage device that will handle the transfer of the images from the cards to the hard drives in case something happens to the laptop. With everything transferred, he'll erase the cards. Blaine travels in Asia to capture colorful, exotic and compelling images for assignment and stock sales, but he also realizes that his pictures have more than commercial value. "More and more, cultures throughout the world are being affected by popular culture," he says. "With quick and easy communication, it seems that every remote village feels the affect of satellite TV and internet." Because of this, the differences between indigenous cultures and the wider world are disappearing. "Anyone traveling and photographing in certain areas of Asia might well get the sense that in some cases they're seeing and photographing what might not be around for long." What he's after especially are places where these cultures still exist, and he can photograph, for example, the role that agriculture plays in people's lives. He may well be capturing stories of lifestyles that may not exist in ten years. Looking for these stories can give direction, even a theme, to your photography. He highly recommends the journey. "I take seriously something someone told me years ago: 'Don't wait for the assignment.' If there's a curiosity and an opportunity, don't wait." Do some research. You'll learn things like the closer to Beijing, the more the Great Wall of China is preserved and renovated. Better pictures result. You've traveled far to take lots of shots, so be sure you've got image backup covered. Know your gear and your settings cold. Most times you won't get a redo of an ideal opportunity. Sometimes weather cooperates, sometimes not. Be prepared. Allow extra time when a place, like a monastery, is going to offer lots of picture possibilities. Pictures of people have two comfort levels: you're comfortable shooting; they're comfortable with you. Boost both levels by being enthusiastic, friendly, confident. Photographs from all points on the compass are featured at Blaine's website, blaineharrington.com.